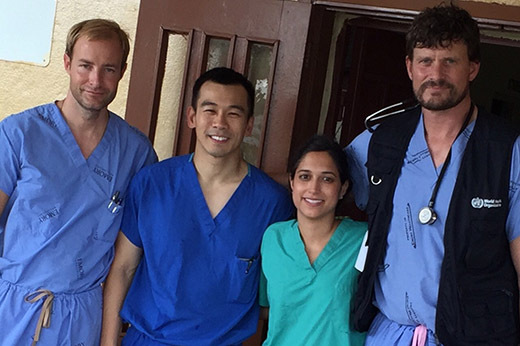 Brent Hayek, MD, Steven Yeh, MD, Jessica Shantha, MD, and Ian Crozier, MD, worked with survivors of Ebola virus disease in Liberia to learn about the frequency of uveitis and other ocular conditions they've experienced. The acute outbreak of Ebola virus disease (EVD) has subsided in West Africa, but the medical community continues to learn about long-term complications for survivors – including the potential for blinding eye disease. One particular condition of concern is uveitis, according to research published in the December 2016 issue of Ophthalmology by physicians from the Emory Eye Center and ELWA Hospital in Monrovia, Liberia. "Uveitis" refers to inflammation of the eye, which can lead to problems ranging from mildly reduced vision to severe vision loss and blindness. Patients with uveitis can experience eye redness, blurred vision, eye pain, headache and/or sensitivity to light. The Ophthalmology paper reports on nearly 100 EVD survivors in Monrovia, Liberia. Liberia, along with Sierra Leone and Guinea, were the three countries most affected by the 2014 EVD outbreak. More than 10,000 cases of EVD were reported in Liberia alone during the recent outbreak; over 28,000 cases were reported during the West African EVD outbreak between 2013 and 2016. "Previous outbreaks have provided limited information on the long-term sequelae after EVD," says Steven Yeh, MD, associate professor of ophthalmology at Emory University School of Medicine. "Being able to work with survivors now gives us many opportunities to understand the long-term ophthalmic and systemic effects on survivors after recovery from their acute illness." The Liberian survivors were examined by Yeh; Jessica Shantha, MD, former ophthalmology resident at the Emory Eye Center; Brent Hayek, MD, assistant professor of ophthalmology at Emory; and Ian Crozier, MD, survivor of Ebola virus disease, in partnership with ELWA Lead Clinician John Fankhauser, MD. They worked with survivors to learn about the frequency of uveitis and other ocular conditions including optic nerve damage, the level of visual impairment in survivors with eye disease, and any structural complications including cataract. Joint pains, hearing loss and hair loss were also observed frequently in EVD survivors. "This has been a great opportunity to help survivors with EVD uveitis and also to help them better understand the vision issues that come as a result," Hayek says. "We’ve also been able to teach and train local providers in Liberia how to best screen and examine survivors with ocular issues and use a mobile clinic design to do it most efficiently." Of the 96 patients examined, 21 had developed an EVD-associated uveitis and three developed an EVD-associated optic neuropathy. In addition, nearly 40 percent of the patients with uveitis were legally blind, based on the World Health Organization (WHO) classification. Other findings include cataract and vitreous opacity (floaters or flashes of light), which can both be complications of untreated uveitis. "Cataract and vitreous opacities were identifiable causes of vision loss in our patient cohort," Yeh says. "These findings have implications from medical and surgical perspectives, particularly given our prior finding of live Ebola virus in the ocular fluid of a recovered Ebola survivor." The public health risk in these cases lies in knowing what kinds of precautions health care workers should take when treating Ebola survivors who develop cataracts. WHO officials have established interim guidelines for caring for EVD survivors in West Africa. Guidelines related to invasive ophthalmic procedures – such as cataract surgery – are still being developed by the WHO, Emory Eye Center and collaborators in West Africa. The findings from the study published in Ophthalmology emphasize the tremendous need for mobilization of resources and funding for EVD survivors throughout West Africa, who are at ongoing risk of uveitis and severe vision loss although the acute EVD outbreak has concluded.